Released on June 7, 2018, the District of Columbia Assessment is based on interviews, observation, and research conducted by a team of expert investigators who analyzed DC’s Family Court and juvenile defense systems throughout 2017. In many respects, the District of Columbia is an example for other jurisdictions across the country to follow as to best practices in juvenile defense. But even in a system as well-funded and functional as DC’s there are challenges in structure and quality that need improvement. 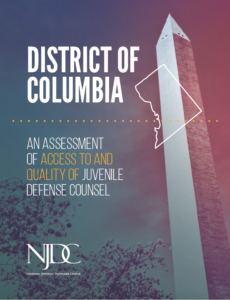 This Assessment outlines the investigative team’s findings and provides Core Recommendations for improving DC’s juvenile defense systems, along with implementation strategies specific stakeholder groups can undertake in order to address shortcomings.